We are always amazed by the unique bikes that are consistently coming out of Indonesia. We’re guessing it’s partly due to the fact that they have limited supplies of decent donor bikes which pushes them to think outside of the square. The latest Indonesian bike that pushes the creative boundaries is this DKW Boondocker racer built by Giant Hermanto and the guys at 15 Manifesto. 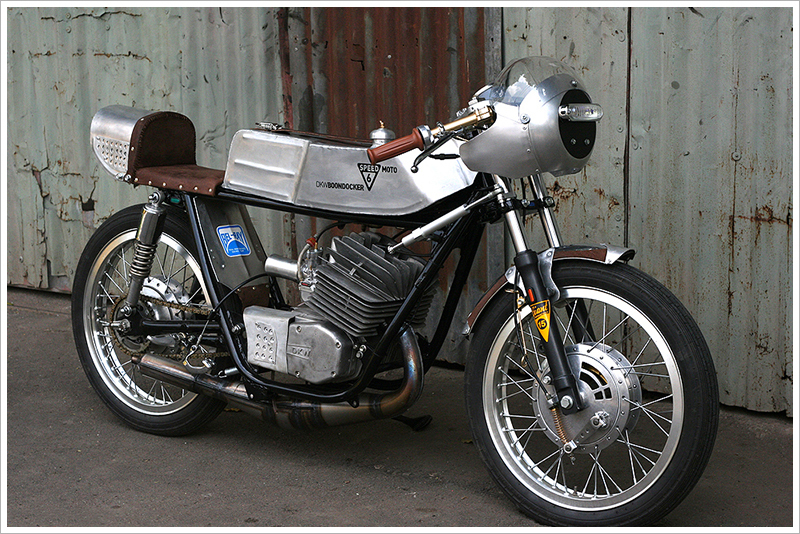 The project started when Giant came across a rusty old DKW engine in a friend’s garage in Bali. These engines are very rare in Indonesian, so he wanted to build something special. Having always been inspired by vintage racers of the past, Giant decided to create “an old school 6 speed racing bike” – similar to the Italian made Gori bikes from the seventies. Some bikes we receive come served on a platter with amazing photos, hilarious quotes and pages and pages of information from the builder. Other times we have to work for it. Like this amazing DKW which was spotted in some random Moscow motorcycle club photos. After a bit of detective work and a couple of emails to our ‘friends’ in the Russian mafia, we quickly tracked down the owner/builder. 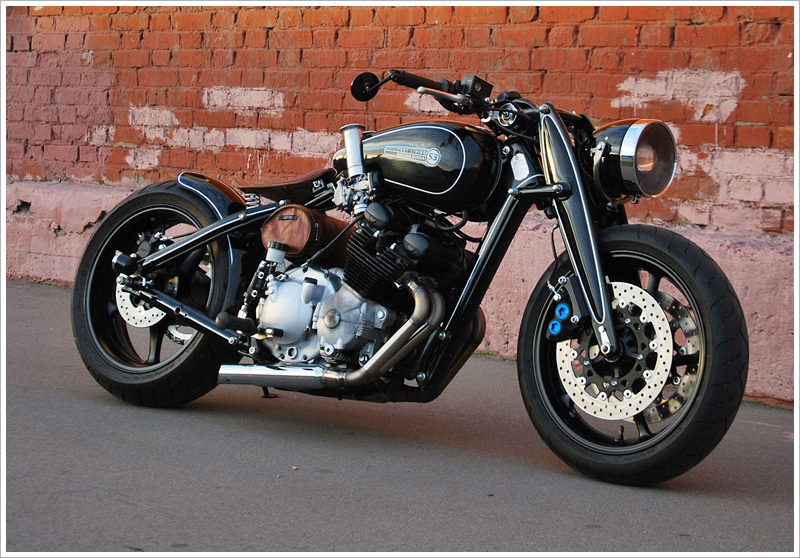 His name is Vasiliy Arkhipov and as you might have guessed from looking at this bike, he has some skills up his sleeve. After working in the automotive industry for over 7 years, Vasiliy who is only 30 years old, now works in the aerospace industry as an industrial designer, specializing in carbon fibre. So he decided to use all of his talents to create a bike that is out of this world. These pics were taken at the Audi Museum in Munich. It’s a stunning 1939 US 250 DKW. The German company DKW where once the largest manufacturers of motorcycles in the world. By 1928 they were building some 65,000 engine units annually, and DKW engines could be found powering some 60 German marques of the interwar period. They soon joined Audi, Wanderer and Horch to form Auto Union in the 1930s, merging again in the 1950s with Victoria and Express to form Zweirad-Union, which in turn was absorbed by Sachs in 1965. DKW motorcycles usually used two-stroke engines and were technically ahead of their time (like most German motoring companies). 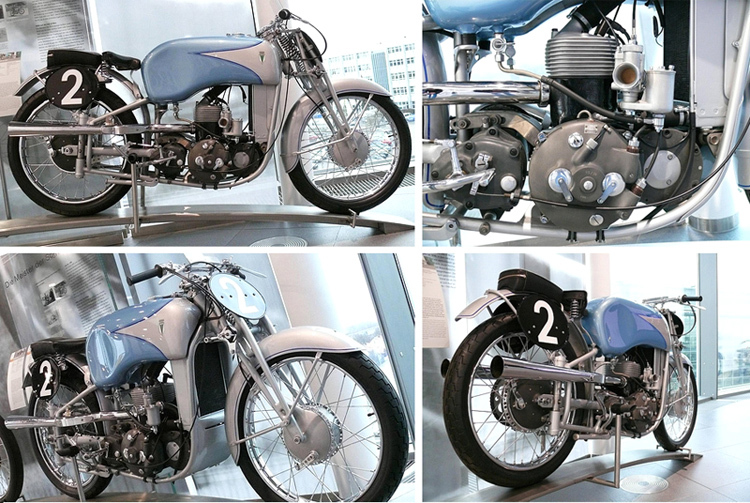 To view more amazing bikes from the BMW museum check out Stefan’s flickr page.